In A.D. 620, six men from Yathrib, a town in an oasis about 250 miles in the north of Mecca, visited Mecca for pilgrimage. 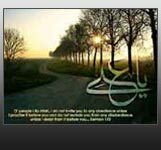 A fortuitous meeting with Muhammad led to their conversion to Islam. They brought to Muhammad's attention Yathrib was in a state of internal conflicts and that it could erupt anytime into civil war. They expressed the hope that Allah would restore peace to their city through His Messenger and they promised to return to Mecca and to meet him the following year. When these six Muslims returned to Yathrib, they spoke to their people and friends about Islam. The people of Yathrib were very much willing and eager to listen to them. During the next years' season of pilgrimage, twelve citizens of Yathrib, including the original six converts, visited Mecca. Also, there were two women among them. They met Muhammad, the Apostle of Allah, at Aqaba who presented and explained them the Articles of Faith in Islam, and all of them accepted Islam. At the same time, they also gave him their pledge of loyalty which is called the First Pledge of Aqaba. and they would be faithful to him at all times. These newly converted muslims requested the Apostle of Allah to send some teacher with them to Yathrib to teach them Qur’an and the precepts of Islam. He sent Mas'ab ibn Umayr, one of his uncles (Mas'ab was the cousin of his father), with the group to propagate Islam in Yathrib. Mas'ab's mission was successful, and many families in Yathrib converted to Islam. The Second Pledge of Aqaba is a landmark in the history of Islam. It was the much needed shelter that Islam was looking for in the turbulent storm it was facing in hostile Mecca. In A.D. 622, seventy-five citizens of Yathrib visited Mecca in the season of the pilgrimage. Muhammad met them at the same spot at Aqaba where he had met the group of twelve the year before. These 75 men and women also converted to Islam and gave him their pledge of loyalty, and invited him to Yathrib. Muhammad's uncle, Abbas ibn Abdul Muttalib, was with him on this occasion. He said to the "hosts" from Yathrib: "Muhammad is held in high esteem by his own people. If you can stand by him through thick and thin, take him with you to Yathrib; if not, then abandon the whole idea." One of the leaders of the Yathribites was Bera'a ibn Ma'roor replied: "When we were children, our favorite toys were swords and spears." Another chief, Abul Haithum, interrupted him, and said: "O Messenger of Allah! What will happen when Islam becomes great and strong? Will you then leave Yathrib and return to Mecca?" Muhammad smiled and said: "No. Your blood is my blood and my blood is your blood. From this day you are mine and I am yours, and I shall never part company with you."